Marilyn Manson will release his ninth album, “The Pale Emperor,” on Jan. 20. At his best, Marilyn Manson personifies the ugly underneath of American society, the forgotten element, the casually discarded clique. He’s the dog you left in your car with the windows rolled up on a hot day, while you went inside the gym to work out and worship yourself. And he’s not happy about it. Manson’s last true masterpiece, “Mechanical Animals,” is now 17 years old. For that heavily David Bowie-influenced collection, Manson’s primary sparring partner was bassist/guitarist/co-writer Twiggy Ramirez, who had been a member of Manson’s live band since the group was first “discovered” by Trent Reznor of Nine Inch Nails. 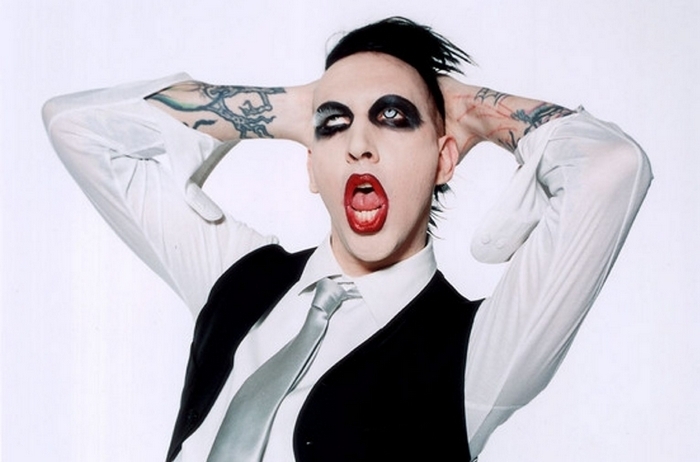 Manson has basically wandered in the holding-pattern wasteland ever since that release, delivering good-but-not-great albums, and generally living off the strength of past successes. Until now. “The Pale Emperor” is the first thoroughly excellent Manson collection of the post-millennial world. Throughout the album, Manson sounds both inspired and disgusted, which is usually the tightrope he walks when he’s doing his best work. And his new collaborator – erstwhile film and video game composer Tyler Bates, who recently scored “Guardians of the Galaxy” – seems to have ignited the bonfire around which Manson is doing his unholy dance. Atop a stripped-down, glam-techno core that at times incorporates elements of psycho-billy and arena-sleaze, Manson and Bates have conjured a hate letter to a Narcissistic culture so enamored of its own reflection that falling into the pool and drowning would be more mercy-killing than tragedy. The album starts with the pure and timely terror of “Killing Strangers,” an unflinching examination of extreme gun culture made all the more eerie by the filthy, swampy and sleazy strut that propels it. (Think Iggy Pop covering latter-period Tom Waits. While drunk. In a cemetery. Well past midnight.) This is rough going, a piece of pop art designed to make the attentive listener uncomfortable, and succeeding in doing just that. Manson lurks behind “Deep Six” with a wicked grin, (“You wanna know what Zeus said to Narcissus? ‘You better watch yourself,” he groans) and basks in the fuzz-bass glory of the decadent “Third Day of a Seven-Day Binge,” both of which are successful in their conjuring of a modern day Caligula’s excesses. Happily, the more esoteric art-rock tendencies of “Mechanical Animals” are in evidence too. “Slave Only Dreams To Be King” employs voice-overs, heavily effected vocals, and layered guitars to build tension ahead of one of the album’s most explosive choruses. “The Devil Beneath My Feet” could be an out-take from U2’s “Achtung Baby,” if that album had been recorded in Hell instead of Berlin. “Odds of Even” ends the album on a hauntingly elegiac note delivered via a sinister waltz rhythm. “The Pale Emperor” rescues Manson from the has-been bin. It’s vibrant and disturbingly relevant stuff.